Chili Pepper Ornamental Goldfinger Capsicum Annuum is a compact and bushy ornamental pepper. Capsicum Annuum seeds can be started directly outdoors, and so called Christmas Pepper is an eye-catching plant that is popular as a Christmas present. 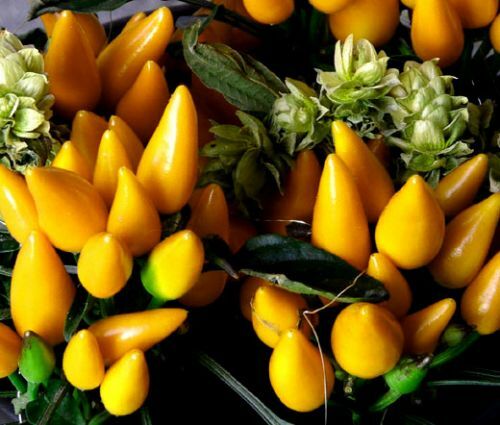 This variety of Capsicum Annuum grows up to 10 inches and features upright growing, finger-shaped, bright-yellow fruits. Chili Pepper Goldfinger is absolutely outstanding as an ornamental plant and it will brighten any landscape or floral arrangement with golden yellow color. Chili Pepper Ornamental Goldfinger is used as a bedding or border plant, and it makes a superb, highly ornamental house plant. Capsicum Annuum is an excellent annual for growing in containers and pots. Ornamental Chili Pepper seeds have to be kept moist until germination, and the established Pepper plant performs best in full sun and moist but well-drained soil. The branches of Goldfinger Pepper can be cut and used in floral arrangements.